Here's an odd one: according to an analyst at JP Morgan, Apple is working on a "converged Mac OS/iOS operating system that allows an iPhone or iPad to dock into a specially configured display to run as a computer." The analysts have dubbed it "iAnywhere" and reckon we could see it in roughly a year's time because the "iPad has not stepped up to become the next growth chariot." You know things are serious when terms such as "growth chariot" are being bandied about. Just think. It could be as big as the Motorola Atrix, or Windows RT! The idea of a converged OS is fun, but it doesn't make a great deal of sense. What problem would it solve? We've already seen what happens when you try to combine desktop and mobile OSes for no good reason: you bring out Windows RT and everybody goes "huh?" I'm not hating on Windows here, but it does demonstrate what happens when you try to make an OS that's desktop and mobile and touch and mouse: it annoys everybody because it's too mobile-y for the desktop users and too desktop-y for mobile. Microsoft tried it, blew it, and has been backpedalling ever since. 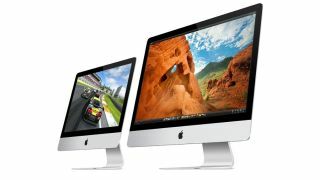 Meanwhile Apple's decidedly non-hybrid Macs have continued to take a greater share of the PC market's money. OS X and iOS are growing closer, but a merger seems unlikely. Here's why. "I'd no more write a book on an iPhone than I'd use an iMac to Instagram my dinner." I reckon I'm a fairly typical computer user. I have a powerful, big-screened computer for work and for demanding tasks such as music production. I have a tablet for shouting at people on the internet when I'm on the sofa. And I have a phone for shouting at people on the internet when I'm on the bus. Each device has different priorities. There's some overlap, of course, but generally speaking my computer is all about the power, my phone the portability, my tablet the ability to wage war from my sofa and chuck videos to my Apple TV. You can take them out of their comfort zones, but that involves compromise: what's just great on a 27-inch screen won't be much fun on a phone, and apps designed for mobile use lack the power you expect from "proper" PCs. I'd no more write a book on an iPhone than I'd use an iMac to Instagram my dinner. The hardware lines may blur - the rumoured iPad Pro and 12-inch MacBook Pro, if they exist, will have broadly similar specs: flash storage, retina displays, multi-core processors, long battery life - but the software remains separate: iOS on an iMac would dumb it down, and OS X on an iPad would be about as much fun as Windows XP was on Tablet PCs. If you want to offer the best of both worlds you have three options. One, you can run two OSes, as an ATIV Q does with Windows and Android (or a Boot Camp-ing Mac does with OS X and Windows). Two, you can make a dual-mode OS like Microsoft did. Or three, you can do what Apple's already doing: share data and features, but keep the systems separate. That seems to be working pretty well so far. It's important to take Apple's pronouncements with a pinch of salt - when Apple says it won't do something, that often just means it isn't doing it right now - but I think Phil Schiller was telling the truth when he ruled out a merger of OS X and iOS. "You'll see them be the same where that makes sense," he said. "And you'll see them be different in those things that are critical to their success." Apple, it seems, is still thinking different.